Hoffman Clark’s forensic accounting expertise is applied to assist businesses, individuals, and counsel who require an in-depth financial investigation. Our team has experience in conducting independent investigations to help organizations respond to allegations of fraud, whistleblower complaints, employee misconduct, and other potentially damaging circumstances. Financial investigations may be related to business operations, reorganization or transactions that involve mistake or fraud depending upon the awareness, sophistication, and motivation of those involved. The investigation might include scrutinizing accounting transactions, record reconstruction, tracing funds, or recovering assets. For investigations involving the propriety of the financial accounting, the subject being investigated can range from revenue recognition to the apportionment, deferral, or understatement of costs. These investigations often involve the impact of accurate accounting on various forms of executive compensation and the value equation in stock transactions occurring during the period of misstatement. 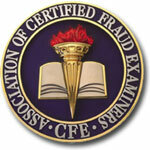 For over 20 years, we have held the Certified Fraud Examiner (CFE) designation – denoting proven expertise in fraud prevention, detection, and deterrence. We also hold the Certified in Financial Forensics (CFF) credential granted by the Forensic and Valuation Services Section of the American Institute of Certified Public Accountants.